Warren Gatland: Game a vital part of RWC prep. WARREN GATLAND SLAMMED critics of Wales’ clash with South Africa as “bitter and twisted” as the two teams prepare to meet in Washington DC on Saturday. Wales are in the American capital prior to their two-match tour of Argentina with their clash with the Springboks at the RFK Stadium taking place outside World Rugby’s designated Test window. Both teams have named youthful sides, but Wales head coach Gatland sees the 80 minutes as a vital part of his team’s preparation for next year’s World Cup. “If anyone has come out and criticised this match, they’re completely ill-informed in terms of how important it is for the long term,” he said. “I think you would have to be someone with a chip on your shoulder or be pretty bitter and twisted to criticise this match because I see it as absolutely vital in terms of our long-term planning for 2019. Wales star George North – the most experienced member of Gatland’s touring party even at the age of just 26 – starts in the unusual position of outside centre against South Africa. Ellis Jenkins captains the side from the back-row for the first time while his Cardiff Blues team-mate Tomos Williams will make his international debut at scrum-half. Uncapped 20-year-old flanker Aaron Wainwright is on the bench where Wales face a late fitness call on Rhys Patchell. Should he fail to be fit, Gareth Davies will step in. Gatland has urged North – who has made three previous starts for his country at centre – to deliver the goods. “Long term I think George is potentially an option in midfield. We’ve seen players in the past that have started their international careers on the wing, like Tana Umaga and Ma’a Nonu, and then moved into the midfield,” he said. “It’s not out of the realms of possibility George could end up doing that in his career, but we are lucky enough to have some talented midfielders already. “I think we’d all love to see him get back to the form he had in 2013. That was a while ago now and at the 2011 World Cup he was absolutely phenomenal. 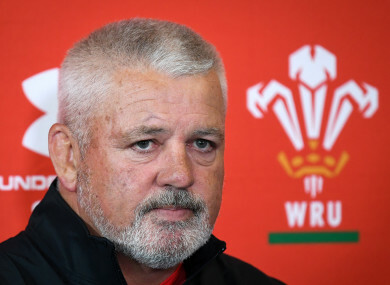 Email “Gatland slams 'bitter and twisted' critics ahead of Wales-Springboks US Test”. Feedback on “Gatland slams 'bitter and twisted' critics ahead of Wales-Springboks US Test”.